This article is a general introduction to French literature. For detailed information on French literature in specific historic periods, see the separate historical articles in the template to the right. French literature is, generally speaking, literature written in the French language, particularly by citizens of France; it may also refer to literature written by people living in France who speak traditional languages of France other than French. Literature written in French language, by citizens of other nations such as Belgium, Switzerland, Canada, Senegal, Algeria, Morocco, etc. is referred to as Francophone literature. France itself ranks first in the list of Nobel Prizes in literature by country. Grand Prix de Littérature Policière – created in 1948, for crime and detective fiction. Grand Prix du roman de l'Académie française – created 1918. Prix Décembre – created in 1989. Prix Femina – created 1904, decided each year by an exclusively female jury, although the authors of the winning works do not have to be women. Prix Goncourt – created 1903, given to the author of "the best and most imaginative prose work of the year". Prix Goncourt des Lycéens – created in 1987. Prix Littéraire Valery Larbaud – created in 1957. Prix Médicis – created 1958, awarded to an author whose "fame does not yet match their talent." Prix Renaudot – created in 1926. Prix Tour-Apollo Award – 1972–1990, given to the best science fiction novel published in French during the preceding year. Prix des Deux Magots – created in 1933. Christine de Pizan – "The Book of the City of Ladies"
^ Roger Cohen, "The Media Business; Books Star on TV, but Only in France" Archived July 25, 2016, at the Wayback Machine, The New York Times, September 10, 1990. Denis Hollier, ed. A New History of French Literature, Harvard University Press, 1989, 1150 pp. 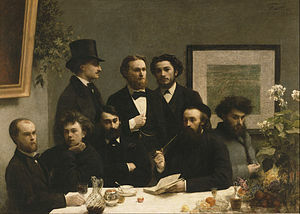 Wikimedia Commons has media related to Literature of France. The Prix Goncourt is a prize in French literature, given by the académie Goncourt to the author of "the best and most imaginative prose work of the year". Four other prizes are also awarded: prix Goncourt du Premier Roman, prix Goncourt de la Nouvelle, prix Goncourt de la Poésie (poetry) and prix Goncourt de la Biographie (biography). Of the "big six" French literary awards, the Prix Goncourt is the best known and most prestigious. The other major literary prizes are the Grand Prix du roman de l'Académie française, the Prix Femina, the Prix Renaudot, the Prix Interallié and the Prix Médicis. Lipp is a brasserie located at 151 Boulevard Saint-Germain in the 6th arrondissement of Paris. It sponsors an annual literary prize, the Prix Cazes, named for a previous owner.